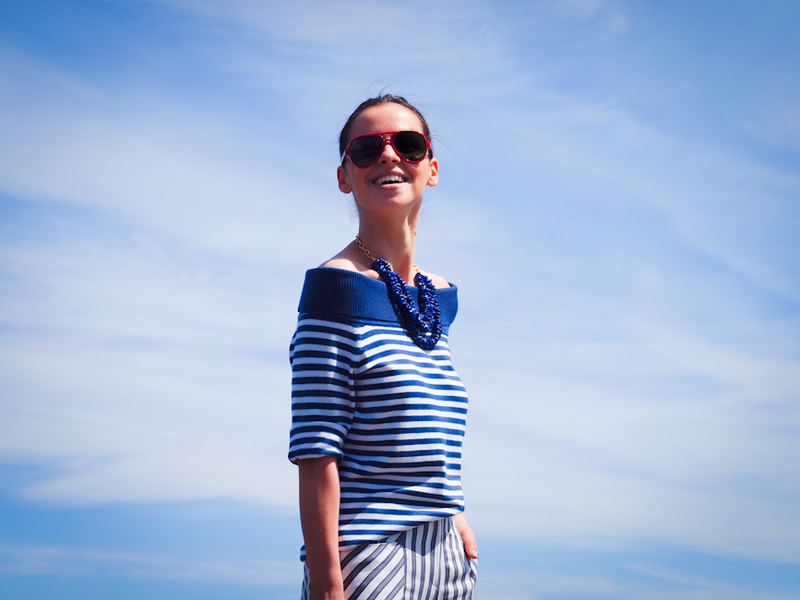 Another weekend look, having a striped sailor moment with easy to wear pieces in a navy-white-red combination. STRIPES are not just for sailors and I totally embrace this trend! Fantastic ensemble – I always love a stripe although I’m not sure I”m brave enough to wear them from head to toe, I love how the changing directionality of the stripes add so much interest to this look. Pretty fabulous! Cita frumusete,tare imi place tinuta! Loving the mix n’ match stripes & the great neckline for the top. Tres chic! Interesting combination! Love your pants! Me encanta el look! Los pantalones son ideales! Estás perfecta! I like stripes SO much, and love how you combined the both prints!!! !the necklace is great too! Love stripes on stripes, great pants! What a coincidence ! I am also wearing striped top today but paired with leo print scarf !! Love your style !! stripes on stripes on perfection! Loving the nautical! Looks great on you. Loved finding your blog on CNN, pleasant surprise! You look great, and did a good job with the stripes outfit – from head to toe! :) And such a cool sunnies! Such a cute look! Loving those pants! WOW! Can’t tell you how much I love this outfit! Those pants are ridiculously beautiful. You look very cute! amazing look and stunning pics! Stripes gone double or nothing, I like. Gorgeous twin set, you look great! Such amazing mix and match of stripes! Excellent one dear! This top is absolutely beautiful dear Veronica! The neck-cut is so feminine and delicate. I adore how you paired two stripes pieces in one perfect outfit! Great loook, stripes never fail. Love the nautical stripes. Looks great with the white wedges. omg you’re stunning! I love this outfit! The color combination is gorgeous and the shoes are to die for!